Now returning to my ongoing summary and commentary on C.W. Slemming's "Made According to Pattern", the little known, but amazing book about finding Christ in the details of the desert Tabernacle. Chapter 15 discusses the veil. The High Priest alone entered the Holy of Holies only once per year. He offered blood sacrifice for himself and for all of Israel on the Day of Atonement. The shedding of blood and its sprinkling on all the vessels of the tabernacle purged and allowed for the remission of sins. In order to do this he had to part the veil and enter into that sacred space. 1. 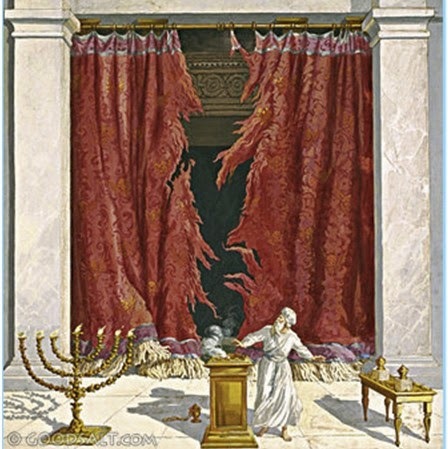 Veil of the Tabernacle: Made by Moses and the children of Israel. Exodus 26:31-37. 31 ¶And thou shalt make a veil of blue, and purple, and scarlet, and fine twined linen of cunning work: with cherubims shall it be made: 32 And thou shalt hang it upon four pillars of shittim wood overlaid with gold: their hooks shall be of gold, upon the four sockets of silver. 33 ¶And thou shalt hang up the veil under the taches, that thou mayest bring in thither within the veil the ark of the testimony: and the veil shall divide unto you between the holy place and the most holy. 34 And thou shalt put the mercy seat upon the ark of the testimony in the most holy place. 35 And thou shalt set the table without the veil, and the candlestick over against the table on the side of the tabernacle toward the south: and thou shalt put the table on the north side. 36 And thou shalt make an hanging for the door of the tent, of blue, and purple, and scarlet, and fine twined linen, wrought with needlework. 37 And thou shalt make for the hanging five pillars of shittim wood, and overlay them with gold, and their hooks shall be of gold: and thou shalt cast five sockets of brass for them. 2. Veil of the Temple. Not the same veil of the Tabernacle. Moses made the 1st, Solomon the 2nd. 2 Chronicles 3:14 And he made the veil of blue, and purple, and crimson, and fine linen, and wrought cherubims thereon. 33 And till Moses had done speaking with them, he put a veil on his face. 34 But when Moses went in before the Lord to speak with him, he took the veil off, until he came out. And he came out, and spake unto the children of Israel that which he was commanded. 35 And the children of Israel saw the face of Moses, that the skin of Moses’ face shone: and Moses put the veil upon his face again, until he went in to speak with him. For many, that veil was not enough to prevent them from recognizing something great in Him. On the Mount of Transfiguration, His glory came through that veil (Matthew 17:2 And was transfigured before them: and his face did shine as the sun, and his raiment was white as the light). 7 And he will destroy in this mountain the face of the covering cast over all people, and the veil that is spread over all nations. 8 He will swallow up death in victory; and the Lord God will wipe away tears from off all faces; and the rebuke of his people shall he take away from off all the earth: for the Lord hath spoken it. 9 ¶And it shall be said in that day, Lo, this is our God; we have waited for him, and he will save us: this is the Lord; we have waited for him, we will be glad and rejoice in his salvation. All veils serve to separate and conceal. Christ IS the way, the truth, the life. The way into the presence of God was not made manifest while the veil of Christ’s flesh remained unrent. The veil was His life, and the rending the veil His death. His death was the fullest manifestation of divine love, to die for another. Simultaneous to His death on the cross, the veil of the temple was rent, symbolic of the way to God being opened unto all. His death thus brought the Tabernacle/Temple dispensations to an end. The veil of the temple was rent from top to bottom. Matt 27:51: And, behold, the veil of the temple was rent in twain from the top, from heaven, to the bottom, to earth. Ether 3:6 And it came to pass that when the brother of Jared had said these words, behold, the Lord stretched forth his hand and touched the stones one by one with his finger. And the veil was taken from off the eyes of the brother of Jared, and he saw the finger of the Lord; and it was as the finger of a man, like unto flesh and blood; and the brother of Jared fell down before the Lord, for he was struck with fear. Ether 3:19-20 And because of the knowledge of this man he could not be kept from beholding within the veil; and he saw the finger of Jesus, which, when he saw, he fell with fear; for he knew that it was the finger of the Lord; and he had faith no longer, for he knew, nothing doubting. Wherefore, having this perfect knowledge of God, he could not be kept from within the veil; therefore he saw Jesus; and he did minister unto him. 13 Come unto me, O ye Gentiles, and I will show unto you the greater things, the knowledge which is hid up because of unbelief. 14 Come unto me, O ye house of Israel, and it shall be made manifest unto you how great things the Father hath laid up for you, from the foundation of the world; and it hath not come unto you, because of unbelief. 15 Behold, when ye shall rend that veil of unbelief which doth cause you to remain in your awful state of wickedness, and hardness of heart, and blindness of mind, then shall the great and marvelous things which have been hid up from the foundation of the world from you—yea, when ye shall call upon the Father in my name, with a broken heart and a contrite spirit, then shall ye know that the Father hath remembered the covenant which he made unto your fathers, O house of Israel. Ether 12:19 And there were many whose faith was so exceedingly strong, even before Christ came, who could not be kept from within the veil, but truly saw with their eyes the things which they had beheld with an eye of faith, and they were glad. Ether 12:21 And after the brother of Jared had beheld the finger of the Lord, because of the promise which the brother of Jared had obtained by faith, the Lord could not withhold anything from his sight; wherefore he showed him all things, for he could no longer be kept without the veil. Doctrine and Covenants 67:10 And again, verily I say unto you that it is your privilege, and a promise I give unto you that have been ordained unto this ministry, that inasmuch as you strip yourselves from jealousies and fears, and humble yourselves before me, for ye are not sufficiently humble, the veil shall be rent and you shall see me and know that I am—not with the carnal neither natural mind, but with the spiritual. Jealousies, what are these? It is covetousness, envy, wanting or desiring something that is not yours. It involves comparing what you have to what others may have. At its root is pride, not being adequately grateful for what the Lord has bestowed upon you. 1 Corinthians 3:3 For ye are yet carnal: for whereas there is among you envying, and strife, and divisions, are ye not carnal, and walk as men? Fears, what are these? Fear of what? Why would fears keep us from rending the veil of unbelief? Do fears represent doubt? The only scripture that comes to mind is 1 John 4:18 There is no fear in love; but perfect love casteth out fear: because fear hath torment. He that feareth is not made perfect in love. As we seek to love the Lord and others perfectly, aren't our fears diminished? Do we have fear of what man can do? No, because as we have perfect faith in Christ, we trust Him to fight our battles, guide us, lead us safely home. Being sufficiently humble. How do we know when we are sufficiently humble? Well, if we haven't rent the veil of unbelief, I guess that tells us something. How do we humble ourselves before the Lord? There are actually many examples of this in the scriptures. It involves repentance, recognition of one's dependence on God, that He delivers us, that He blesses us, that all we have comes from Him. Mosiah 4:11 And again I say unto you as I have said before, that as ye have come to the knowledge of the glory of God, or if ye have known of his goodness and have tasted of his love, and have received a remission of your sins, which causeth such exceedingly great joy in your souls, even so I would that ye should remember, and always retain in remembrance, the greatness of God, and your own nothingness, and his goodness and long-suffering towards you, unworthy creatures, and humble yourselves even in the depths of humility, calling on the name of the Lord daily, and standing steadfastly in the faith of that which is to come, which was spoken by the mouth of the angel. To demonstrate humility, remember the Lord, His greatness, goodness, long-suffering, and our nothingness...call on the name of the Lord daily, have faith. We can pray to know what jealousies and fears may be limiting us in our quest to rend the veil. We can pray to know how we can be more humble. As we strip away and are cleansed from jealousies and fears, and humble ourselves to the dust, what are the promises made in Doctrine and Covenants 67:10? 3) You shall know the Lord. Your knowledge, like the Brother of Jared, will be perfect...and thus you will no longer be kept from within or without the veil and you will enter His presence. Amazing, truly. Let us all press on. James, I don't comment too often on any blogs. But I've been reading a lot of your various posts and have been very edified. Remarkably so. Thank you for taking the time to organize your thoughts and share them. This one was particularly important for me as the spirit spoke to me as to some things I need to do.